Trindade's Bernardo suffers further pain while lying on the grass. 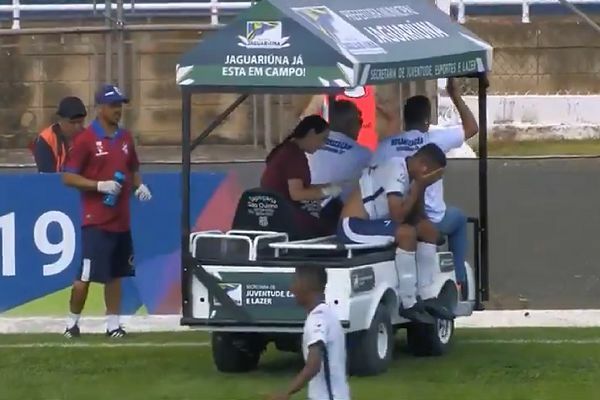 The medical cart, brought on to wheel injured players off the pitch, ran over Brazilian side Trindade’s Bernardo as he lay stricken on the grass awaiting recovery. Trindade, who experienced relegation from local league Goiano 2 last season, faced Brasileirão giants Flamengo in round 2 of the pre-season São Paulo Junior Soccer Cup 2019 on Sunday. After being brought down by one of the opposing players, midfielder Bernardo suffered further pain when the electric vehicle drove to too close to him and passed the wheels over his foot. The player held his head in his hands as he was driven off the pitch. However, his sacrifice was not in vain as the lower-league team triumphed 1-0 over Flamengo in the under-20 tournament, delighting fans and staff alike.